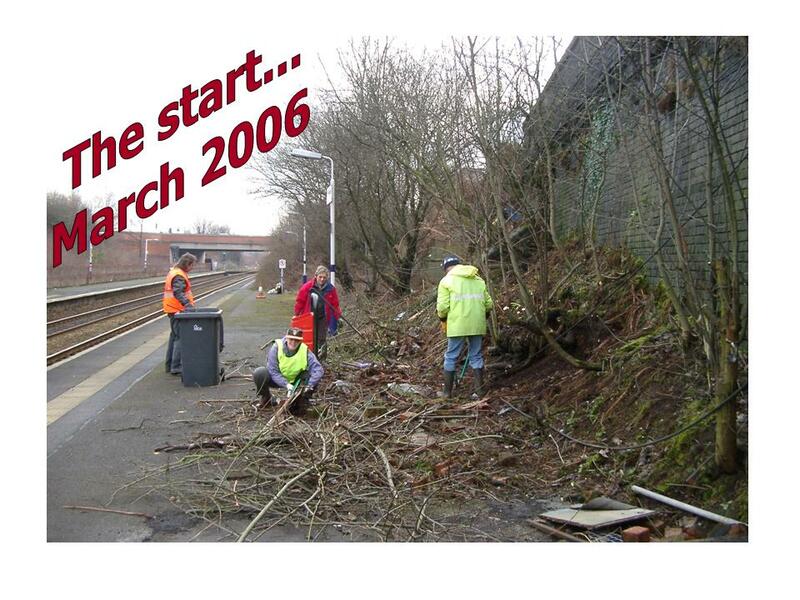 Volunteers welcome - there is always plenty of work to be done ! 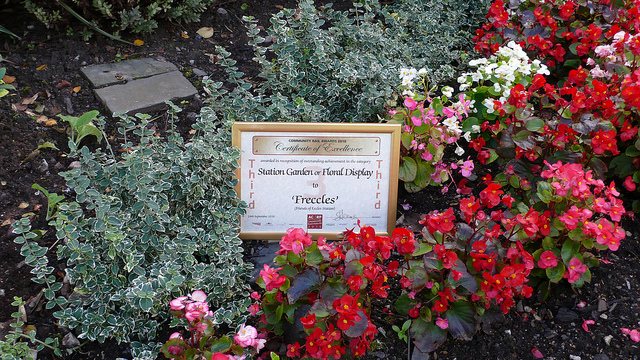 September 2010: FRECCLES wins 3rd prize in National Award for Station Garden ! 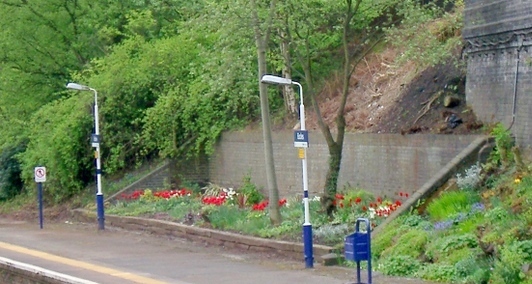 FRECCLES are pleased to announce that the gardens and planters that they have been creating over the past five years at Eccles station have been awarded Third place by the judges from the Association of Community Rail Partnerships (ACoRP) "in recognition for their outstanding achievement in the category of Station Garden or Floral Display" in the national Community Rail Awards 2010. 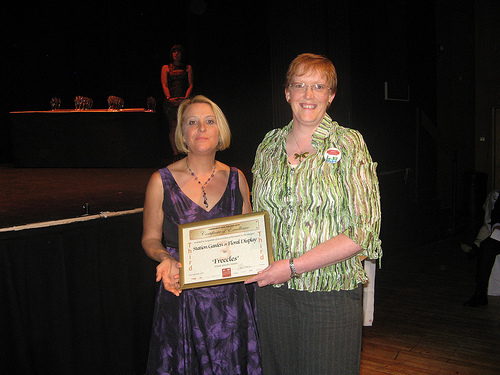 The award was presented at a gala dinner and presentation ceremony held at the Cliffs Pavilion in Westcliff on Sea in Essex on Friday 24th September 2010. Elizabeth Charnley, Secretary of FRECCLES for the past five years, received the award on behalf of her colleagues at FRECCLES. 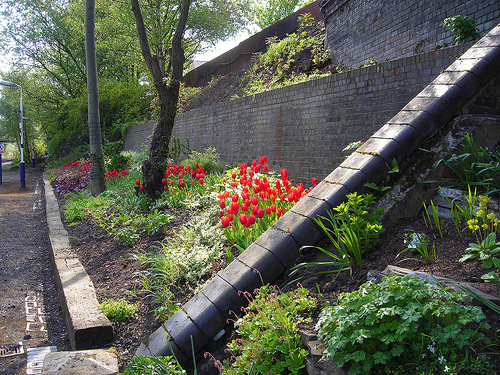 "This award is a superb achievement and recognition of our work over the past five years and spurs us on even more to continue our work going forwards to maintain the work we have already done and continue with our plans for an alpine rockery and a wildlife garden on the Liverpool-bound platform. 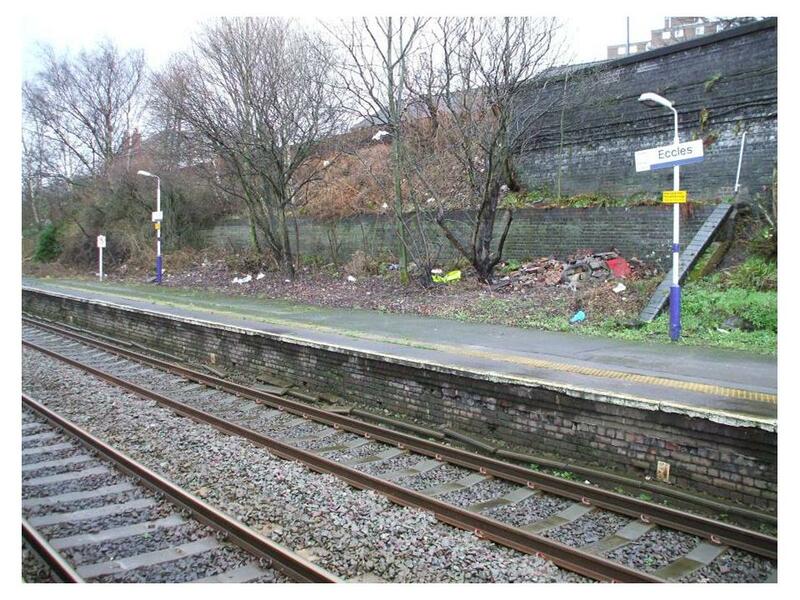 We would like to thank all those who have supported us so far with funding or assistance, including Eccles Community Committee, Salford City Council, Northern Rail, Network Rail, O2 (It's your community) and GMPTE. This award truly belongs to all our members who have turned out (in all weathers) at the clearing, planting and planning sessions over the past five years or have given us donations and subscriptions to help pay for the plants, bulbs and equipment that have produced the display we have today and has won us this award. 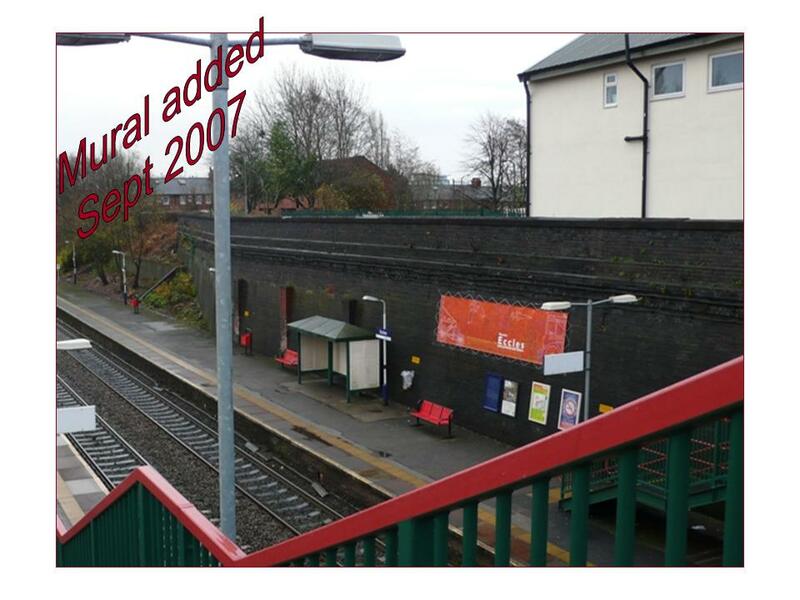 When we started five years ago, the station looked very unloved and unwanted and was not an attractive place to catch a train to or from. The award is such a wonderful crowning glory to the same month that we celebrate our fifth birthday and stage our first open day that included tours of what is now our award winning garden! 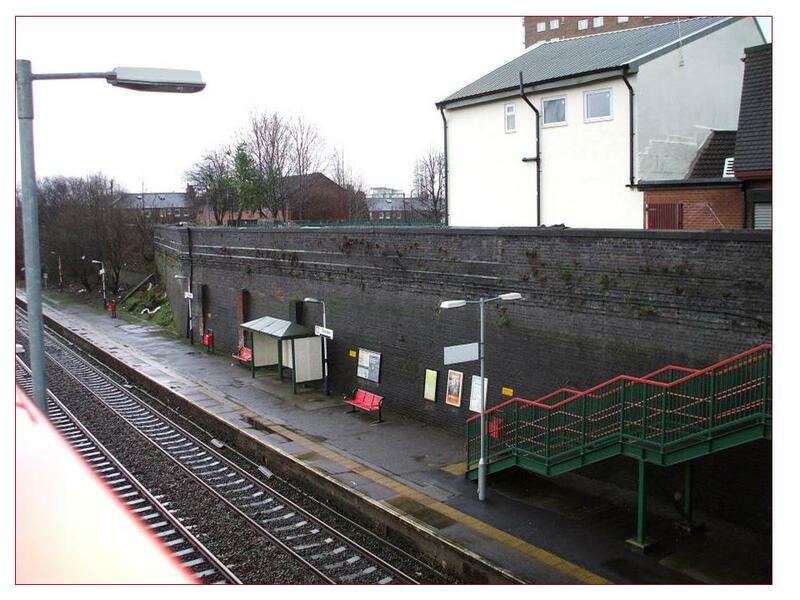 Recently, a senior member of railway management staff referred to our station as a 'flagship on the line', something that we are immensely proud of, but to have our work recognised independently and nationally is something very special and makes all the hard work worthwhile. We have been advised that the 'Station Gardens or Floral Display' category is one of the most keenly contested in the Awards and to receive a place in the category is a real achievement. 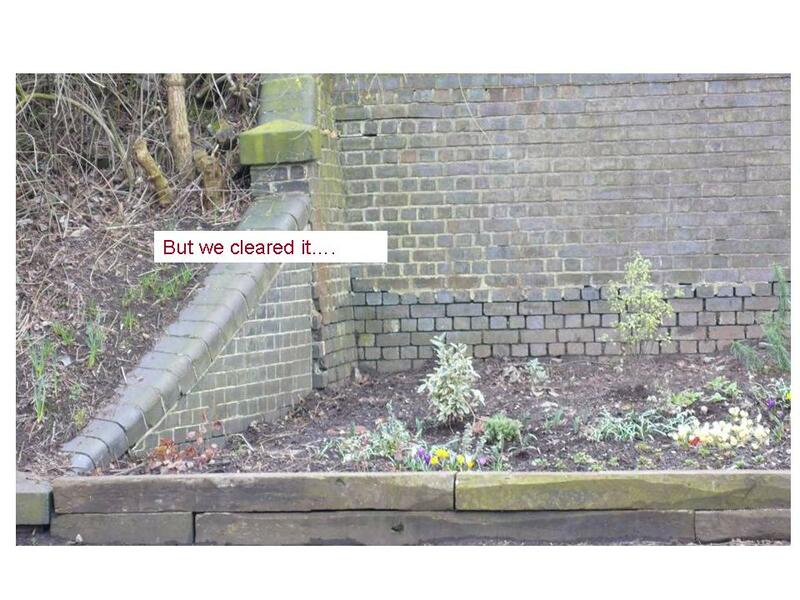 Our work will continue and we will be meeting again for the next clearup and planting session on the first Sunday of every month at 11am if anyone (over the age of 18) would like to come and help us in our work, please come along to the station on the day or give us a ring on 0161 789 5016 or email info@freccles.org.uk"
Here are some pictures showing the changes Freccles has made to the gardens on the Liverpool platform at Eccles Station in the period 2006 to 2009. Click on each picture for a detailed view. The Rockery (Bay One) has had a good display of colour over the summer. 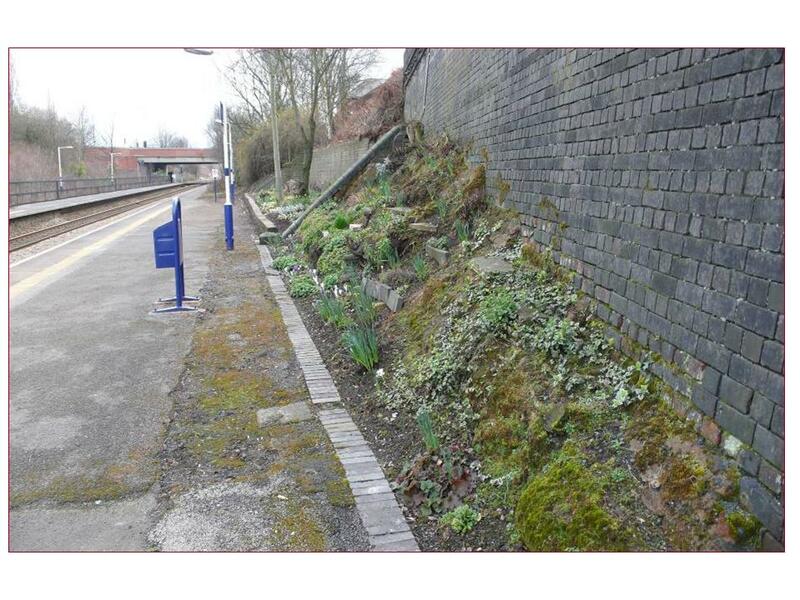 There has been some damage caused by removal of vegetation from the station walls (see below) but this has been largely rectified while some bulbs have been planted along the platform edge. 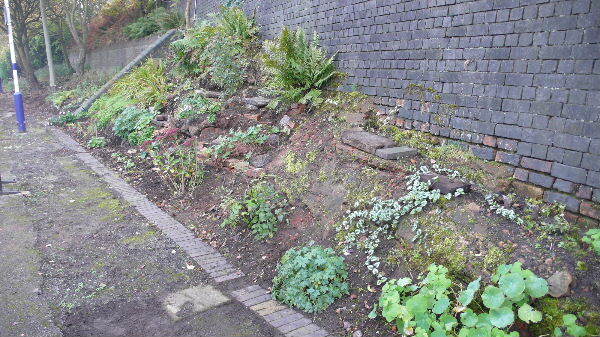 Maintenance of the rockery and slow improvements will continue. 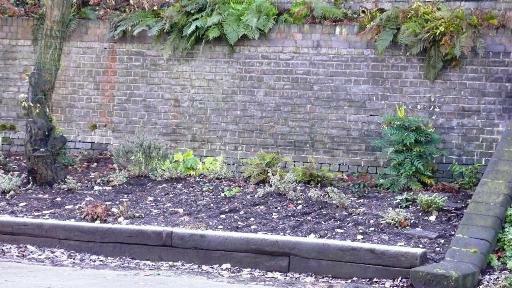 Bay Two has now been more or less fully planted with large and small shrubs and bulbs. 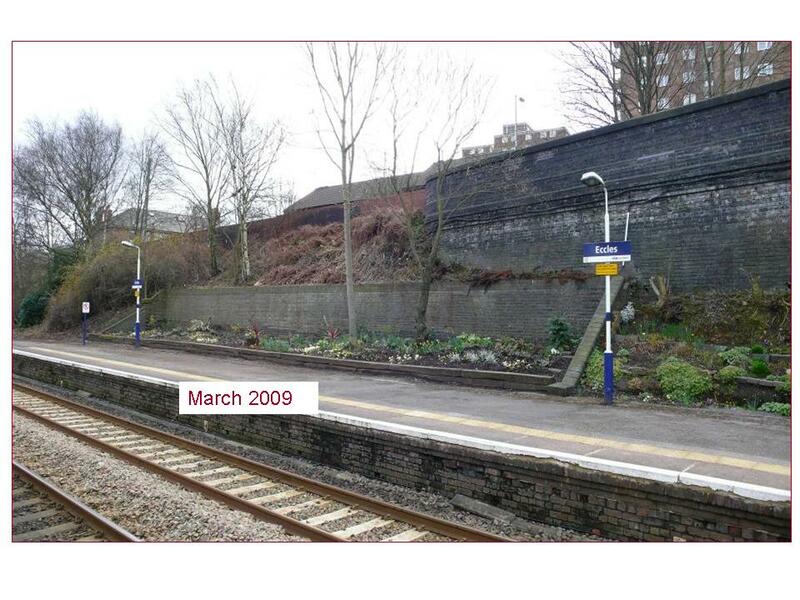 Some planting will continue using the wave pattern pioneered by our gardening group. 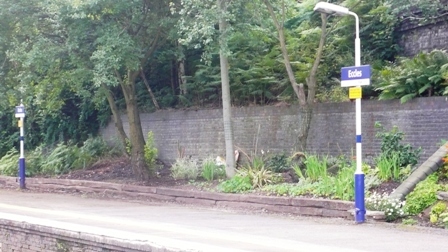 Network Rail have removed 2 trees from the east of the bay and decisions will be required on the future of the 2 remaining trees while the garden as a whole has benefited from the removal of unwanted vegetation from the station walls. 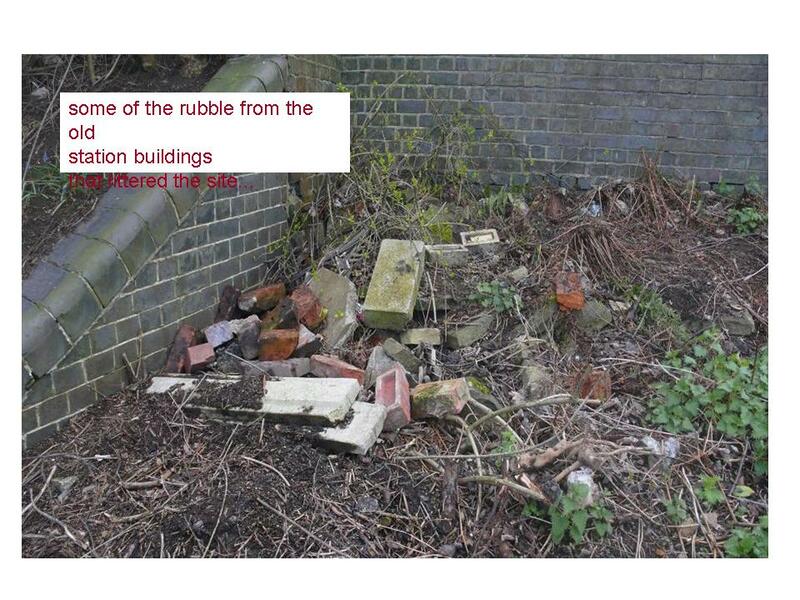 In Bay Three, the wildlife area, the priority is to remove accumulated fly-tip debris and Network Rail have indicated their willingness to help with this. Subject to resolution of access issues, work can then proceed to develop the wildlife aspect of the garden. 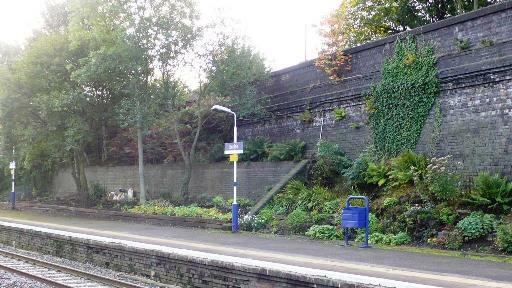 Finally, the planters on the Manchester platform have been a great success and there are plans to replace some plants with heathers for the winter months. 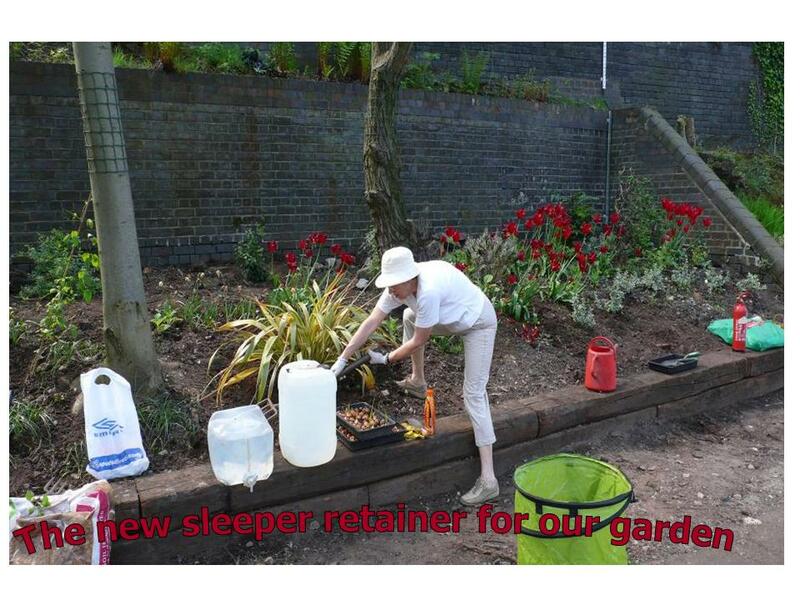 If you wish to join in our gardening activities, you would be most welcome. 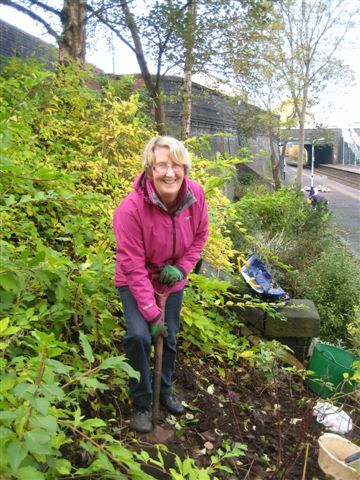 The gardening group has a monthly gardening and maintenance session on the first Sunday of every month at 11 a.m. - do come along! 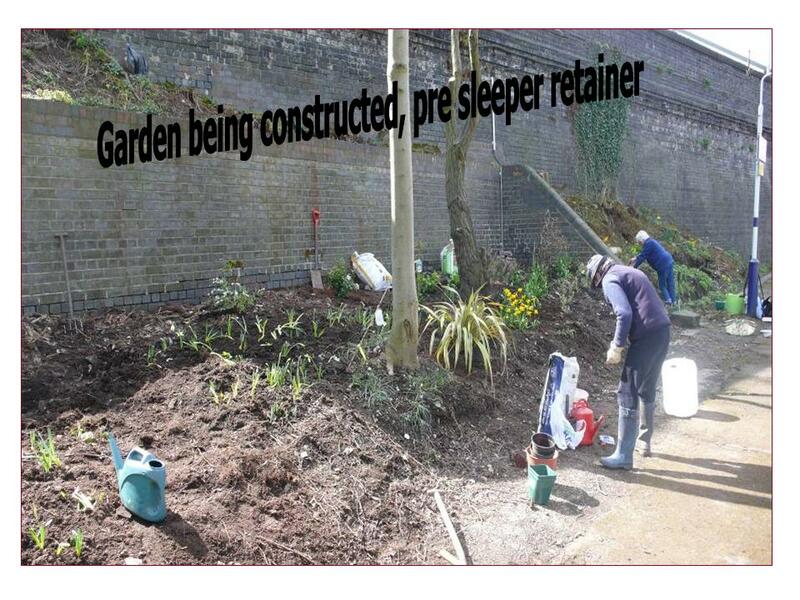 This photo shows a small part of the garden that we have so far been able to renovate. 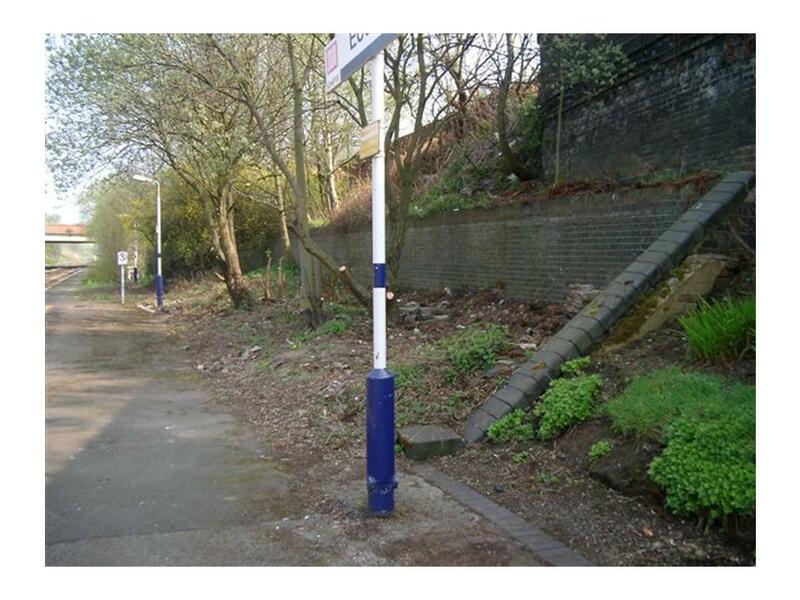 We are pleased to announce that Freccles has been awarded funding towards our Sustainable Garden planting project for the Liverpool (westbound) platform from the It's Your Community fund sponsored by O2. Each month up to 60 projects throughout the UK receive up to £1000 of It's Your Community funding. Awards must be for the benefit of the community or to build community spirit. For more information about the hundreds of projects which have already received an award and how to apply for one, visit www.itsyourcommunity.co.uk. ... and this shows what remains to be done.